December 4, 2018, 5:27 PM · One trait I wished I had been born with was a lack of self-consciousness. My inner convictions took a back seat to letting myself feel scrutinized by others. Unfortunately, as a violinist I would listen to bad advice and try to incorporate it into my playing. For instance, just as my left hand was getting stronger and more spontaneous, I would hear constant reminders to keep the hand relaxed. There were mixed messages that confused me. My hand was developing its techniques of touch, and I was gaining a sense of familiarity with the neck, the strings, and the violin’s angles. Most important of all, the air space surrounding my hand felt like it was part of my technique; tactile sensations were as reliable as the feeling I got from my shoulder pad. However, this compulsion to be relaxed interfered with the strength my hand needed to acquire. Notions of relaxation made my hand feel weaker and took attention away from playing in tune and keeping a solid structure. I’ve learned that it takes a lot of skill to be relaxed in my left hand. A certain amount of tension is built into all the actions that take place. Play a double stop fourth or major third and notice the thumb pressing against the neck. Feel the wrist compressing and losing its elasticity. 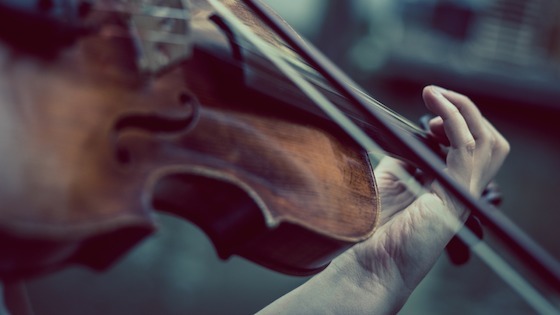 Sacrifices happen when you play an instrument in which your fingers are dancing around such tiny areas and the bow arm needs to be strong and rhythmic. It’s a simple fact that the left hand tenses. Learning how to relax a periodically tense hand is different than always keeping the hand relaxed. The most common problem among string players is squeezing the neck. It’s easy to say that you shouldn’t do it, but pressing down on the fingerboard, changing strings at lightning speed, and vibrating all invite tension and pressure. Invite doesn’t quite describe it. It’s more like these actions “compel” the hand to tighten. Such are the ramifications of what we do with our left hands. Just as “human nature” illustrates our weaknesses, “physical nature” reminds us that lots of action will produce some tension. We learn our individual ways to manage and minimize those pesky by-products of vibrating, shifting, and sliding. I wanted an exercise that would let the left-hand “breathe” and not create friction with the violin’s neck. The exercise needed to be useful for the variety of ways violinists hold their instruments. Some make contact with the thumb only, while others let the side of the index finger touch the neck. There are those who play with higher fingers and touch directly on the fingertip. Others play with the fingers at a lower angle, with their thumb underneath the neck. A popular but somewhat quirky style is with a high thumb that seems to fly all over the place. All of these methods work well, and every violinist should have the freedom to pick what comes most naturally to him. The most effective exercise has a universality about it that allows for individual differences. In this exercise, I start with the bow on the D string and play the notes D, E, F sharp, G, and A. The first grouping is D – E, then E – F sharp, F sharp - G, and G – A. I notice how each pair of notes creates a completely different hand position relative to the fingerboard and neck. By isolating each pair, it becomes more obvious when tension and excessive pressure build up. Sometimes natural pressure will occur because of fingers moving downward on the fingerboard and the thumb clinging sideways. Contrary motion inevitably produces some squeezing. There’s no question that mother nature has side effects, but as long as the tension is released on a regular basis, no damage will be caused. I like to think of the hand “unwinding” following the movement. Stress and calmness are a cycle familiar to violinists. Even the placement of the fingers with their fixed and highly-trained distances on the fingerboard create a potential for freezing. I think about releasing the pressure after each movement. In the miniature world of the fingerboard and its tiny targets, a small amount of relaxation will pay great dividends. Keeping a balanced hand is the key to preventing increased pressure. When you change strings, keep the fingers on top of the new plane. Even the mere hint of falling off into another region of the violin will make the fingers squeeze and hold on for dear life. Vibrato opens up the hand to more squeezing. Just changing fingers puts the hand into new formations, making it more vulnerable to imbalance and pressing. It helps to lead the vibrato confidently from one source, for instance, in an arm vibrato, with the lower arm moving from the elbow. With a strong movement coming only from the arm, it follows that the other movements of the wrist and fingers will react passively. It reminds me of the fins of a fish as it turns a corner. A movement as likely to get stuck as vibrato should have minimal contact with the wood. The only pressure that’s really necessary is the contact between the fingertip and the pitch. The ideal movement reminds me of water traveling through a straw. When pressure from different directions closes the hand and narrows the channel, it’s nice to know that a mere thought can create free passage again. December 8, 2018 at 04:14 PM · Good thoughts! Exactly my dilemma as a teacher—how to keep the hand relaxed through all the pyrotechnics that are just commonplace for violinists. I have my students do a series of what I call fingerdrops—it’s light, decisive, lifting and popping or dropping of the finger from the knuckle. We start with 1st Position, and begin with the 4th finger which simply lifts and drops gently but firmly from the knuckle while the other 3 fingers are near the string but not pressed down—so 4–0, 4–0, 4–0, 4–0 etc...Repeat 4-8 times and move on to the 3, 2, and 1. Lift—drop, lift—drop. During the exercise we watch the thumb so it doesn’t squeeze. This teaches the hand basic articulation without squeezing. Every lift is a release of tension and every drop is an articulation done without squeezing. If done correctly and often enough as a pre scale exercise, the muscles remember the relaxed motion. This can be done diatonically at first, then chromatically as well. It does wonders for not only articulation, and relaxation, but for good intonation, and correct angle of finger to string. You can use it to teach intervals as well! December 8, 2018 at 09:28 PM · Excellent exercise! I like how it combines relaxation with articulation.